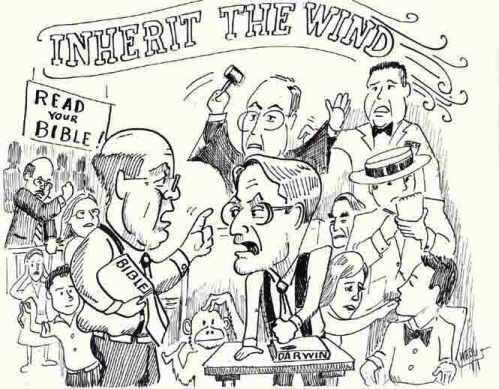 The Mermaid's Tale: Inherit the wind? 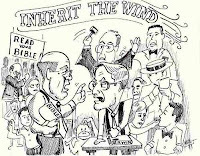 The famous 1955 play about the Scopes trial, Inherit the Wind, is based on a quote from the Bible that warns that if you make trouble in your own house all you'll inherit will be the wind -- "He who brings trouble on his family will inherit only wind, and the fool will be servant to the wise." The Scopes trial was nominally about teaching evolution in schools, but it's not well understood that a main part of the underlying issues was not just stupid biblical literalism or bigotry, but objection (yes, by the prosecuting attorney -- and biblical literalist -- William Jennings Bryan) to the justification based on notions of genetic determinism for racism and inequality. I've discussed this elsewhere. One of the most delicate issues in genetics has for more than a century had to do with intelligence. There are two camps, those who think IQ (whatever it is, something we need not debate here!) is largely 'genetic' and unchangeable, and those who think it is malleable and responsive to environments. As usual, the argument is largely political (for good reasons) but also ideological rather than scientific. The brain is a complex organ that develops rapidly as countless genes are expressed in different tissues, in a highly orchestrated dance of interactions. So IQ, if it's any sort of brain function, must be 'genetic' in the sense that the brain is a product of genetic interactions. More socially important is that all these countless genes and their regulatory DNA sequences are subject to variation among individuals, and that must have some effects on the resulting IQ (again, let's not quibble here about whether experts actually know how to define or measure IQ). Family correlations show evidence of this genetic variation, whether or not the amount of heritability is being correctly estimated, and whether or not the genetic effects do or don't determine the person's achieved IQ (e.g., depending on environment, schooling, etc.). The most fiery aspect of the debate is whether specific genes can be identified that cause or predict IQ. It's bad enough to assume that certain people or groups of people we might not like have low IQ and nothing can be done about it, but even worse if one can identify the responsible genes, because then something can be done about it, and the eugenics era proved that that something was dreadful. There was a lot of pain but all our society inherited from it was wind, nothing of substance. Intelligence and its genetics are involved in all sorts of social science discussions because they affect many aspects of society including investments to address systematic inequality and so on. Some argue that we should not waste money on those with low-IQ genes, others that at least we should help those people raise their achieved-intelligence. These are social and political issues, and yesterday we discussed the problems with the social sciences, so self-described, in terms of whether or how they are actually 'scientific,' or have failed to produce useful results, or whether the experts in this field know more than anybody else -- or can predict the future better than a chimp (untrained at that). We criticized the persistent funding of go-hardlyanywhere research in those fields, as we've done for genetics, our own field. A recent paper by Douglas Wahlsten sheds light on these issues. This is a paper showing from the actual scientific literature how clearly and substantially we have so far failed to identify genes with useful contribution to normal behavior. Nobody doubts the clear evidence for major mutations in genes that can cause serious, clinically relevant behavior problems, and many of these involve mental impairment. However, even the understanding of many serious psychiatric disorders has eluded serious advancement based on genetics, genome mapping and the like. Schizophrenia and autism are two cases Wahlsten mentions. These traits are clearly familial and seem 'genetic' but GWAS have basically identified a plethora of different genes that make individually minor contributions, and no blockbuster single-genes. Even MZ (genetically identical, monozygotic) twins do not have dramatically high concordance. These are apparently polygenic traits, affected by genes to be sure, but generally not by major, common genetic variants. Among the best indicators of this are the paucity of really replicable gene-specific findings for these traits. That means the original finding could be false, or the effect so weak or low in frequency that it simply doesn't recur in different samples. Wahlsten specifically goes after IQ genetic arguments. In essence he shows from the data that even huge samples would identify genes whose effects are less, or much less, than 1 point on the IQ scale (which is scaled to have mean of 100). And these are elusive if they exist--most effects may be even smaller. More than that, the effect seems almost inevitably not to be an inherent one but depends on the variation in genes elsewhere in each individual's genome. Even the total of things found by some of these tests would not account for even 1% of the variation in IQ among the subjects. Yet the hunt for genes for intelligence goes on, in the face of these clear patterns. Even though intelligence is essentially and clearly polygenic. There are few if any smoking gun genes, for the normal range. Even the genes whose variation is known to cause clinically serious impairment typically do not show up as 'hits' in genomewide mapping studies. Predictive power based on genotype is thus very weak indeed. Yet behavioral genetics motors on, with the implicit or explicit promise of prediction based on genotype, a potentially dangerous kind of determinism that history has shown can be badly abused by powers that be. We keep pouring funds into this, as well. We are not arguing that IQ whatever its reality is not 'genetic', but that it is generally not useful to evaluate people based on the geneIQ but on their actual performance. And because the more that is learned about the development and workings of the brain the more is learned about its plasticity, it's clear that intelligence can't be understood without due attention to the considerable environmental influences on the trait. Pulling the plug on this kind of fruitless genomics, which is growing despite these kinds of facts basically across the board, would save resources for things where that kind of science can really make a difference, and be less potentially contentious. What to do as a society about variation in intelligence is a thorny problem, and we don't have any answers. Sadly, as we discussed yesterday, the experts don't have any answers either. But if they stir the pot of our society, hopefully all they'll inherit will be the wind of their pronouncements.